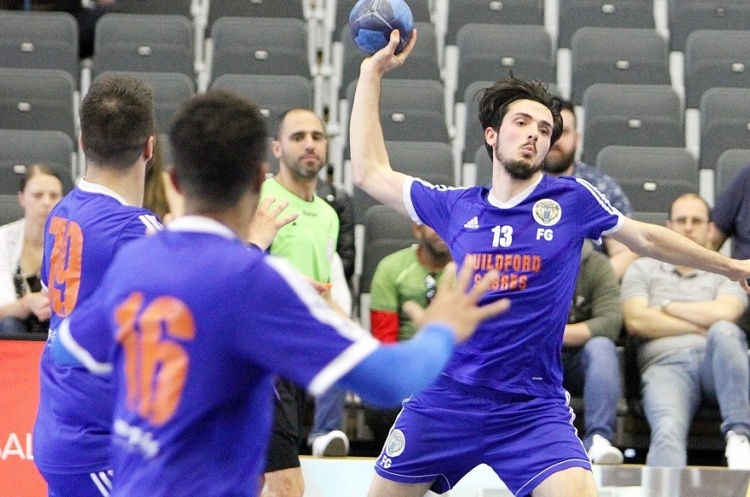 Manchester, Reading Lions, Essex and last season’s finalists, Guildford Sabres, booked their places in the semi-finals of the England Handball Mens’ National Shield. Manchester won through 30-15 at Stroud, extending their advantage in the second half after leading 14-9 at the break. Inspired by the women’s team performance, who won through the semi-finals of the National Cup, Reading Lions narrowly defeated Bristol. Lions were six goals ahead at half-time. Bristol fought back in the second period and reduced the deficit to three goals by the final whistle. Lukasz Gajewski and Fabien Maisonny both netted eight times for Lions, and Mariusz Masiak scored ten for Bristol. Essex beat Bucks Bullets 37-23. Essex shared the goals around, Dale Morgan top scoring with seven. Bullets’ Nathan Grant-Williams led the scoring charts in the match with eight strikes. The final quarter-final pitched north against south, with Guildford Sabres playing Newcastle Vikings. Sabres were led by seven at half-time, increasing their lead by one goal after the break as they won 33-25. The National Shield semi-finals will be contested on the weekend of 16/17 March.